I picked up my local paper last week and the first thing I noticed was a large print advertisement across the top of the front page and a QR code in the corner. I thought to myself that this is one of the rare times someone actually seemed to know how to properly use a QR code. Using this QR code as an example I hope I can elaborate on how you should use QR codes for your own particular need, specifically for physical advertisements. In this case the advertisement was for LimelightDeals.com, a company that helps to promote local deals in local advertisement campaigns. In particular the advertisement highlighted a special deal for Wild Willy’s Burgers in Rochester, New Hampshire, where you get $40 for the cost of $20. A pretty great deal if you are looking for an inexpensive night out. In a traditional advertisement though, the conversion ratio probably wouldn’t be terribly high since it would require the consumer to remember to visit the site later. So not only might they just be too lazy to type in the web address, they might also forget to check it out later when they are in front of their computer. In the actual advertisement we see here though, they have added a QR code and taken the advertisement into the 21st century. What this QR code intends to do here is dramatically increase the conversion rate of newspaper readers. Now people simply have to take their phone out of their pocket and they are directed to a landing page where they can take advantage of the deal immediately. They are now more likely to act on the advertisement, increasing the value of the advertisement for all parties involved. The QR code, in this particular case, then takes the consumer who scanned the code to a landing page with the specific deal (at least it should, have, instead I was taken to a deal on a local spa). From here the consumer can purchase the deal, but not only that, the mobile website is set up to show other deals in the area for other local companies. So if someone goes to buy this particular coupon they will also see other’s that they might be interested in. 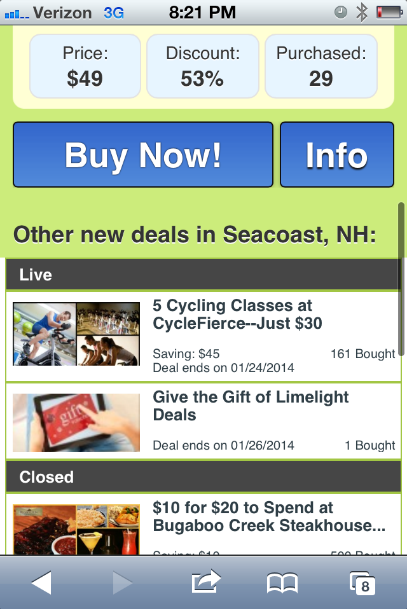 Thus helping boost local business sales as well as LimelightDeals.com sales. This is one way in which you can drive other sales through your QR code by sending consumers who scan the code to a landing page where there are other special deals or similar content for sale. Now instead of simply seeing an advertisement and having some tiny percentage of consumers act on it perhaps later in the day or week you now have an advertisement where consumers can immediately act and you can use this immediate action to show them not only the content on the physical advertisement but other content as well, meaning they may purchase even more. What a QR code is really quite good at is providing consumers with an easy tool to access information, deals, entertainment etc., at the exact moment they are most interested. People are also lazy, so the easier you make it for them to access these benefits the better off your advertisement will be. Using QR codes on your physical advertisements to provide relevant content to your consumers—if used correctly—will ensure more sales, greater brand interaction, and a more successful advertisement campaign. Just make sure you use a QR code platform that will let you reach your advertisement campaign’s maximum potential with all the right technical tools. 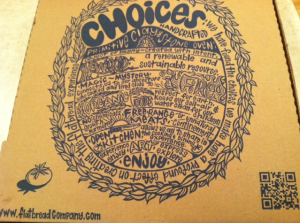 I ordered pick-up from Flatbread—my favorite local pizza place—this past weekend, and after I got home and stuffed my face with my paleo cheat meal, I noticed that the box had a large QR code on it. Obviously I had to scan it. What I found was a perfect example of how a lackluster QR code can be made much better. What I noticed first off with this particular QR code is that it lacked a call-to-action. A QR code without a call-to-action is almost always unadvised. The call-to-action is generally what convinces someone to scan your code in the first place, so to not have one means you will see drastically lower scan rates. To fix this you obviously need to put a call-to-action next to the code, but a call-to-action that says something like “scan the code” is not going to cut it. What you want is a call-to-action that clearly states the benefit someone will receive if they scan the code—like “Scan here to receive a free music download!”, or “Scan here to download the app!”—or that appeals to their curiosity and makes them want to find out what is on the other side of the QR code. 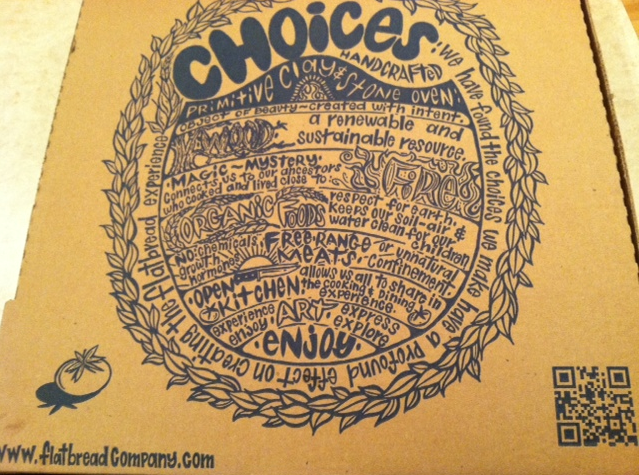 After scanning the QR code on the Flatbread pizza box I was then taken to their beautiful desktop website. However, despite their fantastic looking and creative desktop website, this is another area where this particular QR code (and many other QR codes I see on a daily basis) can get better. 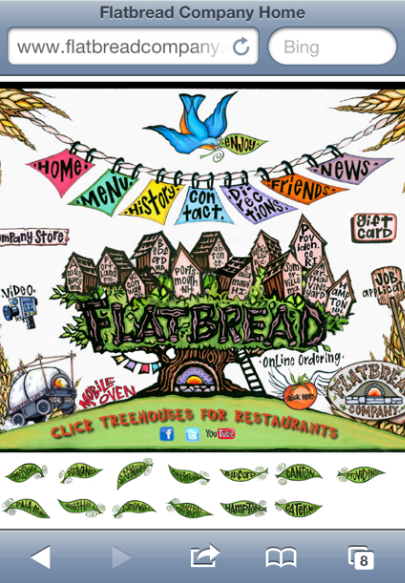 First off, the desktop site is hard to navigate on a mobile phone, particular the Flatbread site. Since more than half of Americans own smartphones you need to make sure you have a mobile site to go along with your desktop site, and the QR code should be directed to the former not the latter. Not doing this means far fewer people who scan the code will actually stay on your site. Second, make the landing page from your QR code actually relevant or interesting to the customer. 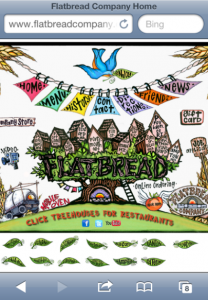 In this particular case what good does it do me to be taken to the Flatbread desktop site? There is really very little there I might be interested in since I’ve clearly already ordered, know the location to pick up my order, and have seen the menu. Instead what could have been done here is have the QR code point you directly to information about the various ingredients; perhaps where the organic meat or vegetables are from, or how the food is prepared. Or perhaps the QR code would direct you to a coupon where you could either save it on your phone or print out for the next time you order, this might incentive a larger number of future orders, and provide a mutually beneficial experience. There are many possible ways to improve your QR code use, but these few are incredibly important (assuming you have all the technical best practices already taken care of). Just make sure your call to action is one that will interest people enough to scan your code, and that your landing page is relevant to the person who has chosen to scan your code. Give the customer something they want, and create a code that leaves both parties better off for taking the time to scan. It’s as simple as that. A call-to-action is incredibly important if you are going to use QR codes, particularly if you plan on using them well. A call-to-action is the catalyst to spark interest in the target audience member to make them scan the QR code. Without this catalyst most people will simply go on with their day and fail to recognize the benefit of scanning your QR code. This does not mean your call to action needs to be elaborate or even specific in its description; it just needs to be something that will create enough interest or curiosity to convince someone to scan the code. 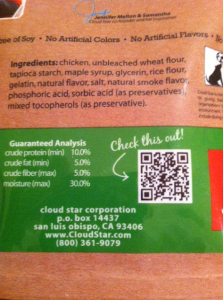 For example, on the back of this Buddy Biscuits dog treat bag, directly above the QR code, reads a simple but effective call-to-action: “Check this out!” With an arrow pointing to the QR code. I know it might not seem like the greatest call-to-action at first glance, but it is effective. In fact I chuckled at it when I read it, and thought to myself how incredibly effective and yet kind of lame it was at the same time. This code doesn’t tell you what you will receive by scanning the code, but it appeals to human nature and piques their curiosity. It makes you wonder what might be on the other side of that QR code, and increases the likelihood that you will scan the code. Which is the whole point in the end. Unfortunately the landing page isn’t all that spectacular and most people who scan the code are likely to just quickly exit the page (why not offer some special deal for online orders, or a video of how the treats are made, or even just give me videos of puppies rolling around looking adorable…actually that last one should be a no-brainer). But this brings me back to my original point: even if your call-to-action is perfect, every other part needs to be perfect as well. If people are convinced to scan your code because of your great call-to-action does it really matter if the content you are offering on the landing page is useless or uninteresting? Or if your interface is frustrating to use? Or your code is too dense? Either way your QR code will fail to do its job. In the end you call-to-action is vitally important to the success of your code, but so is every other aspect. Your code is only as good as your weakest link, so make sure your weakest link is great. People may wonder why they should use QR codes, or perhaps don’t see a valuable way that QR codes could help their particular business. The truth is almost every business can benefit from using a QR code (just make sure you follow our best practices. 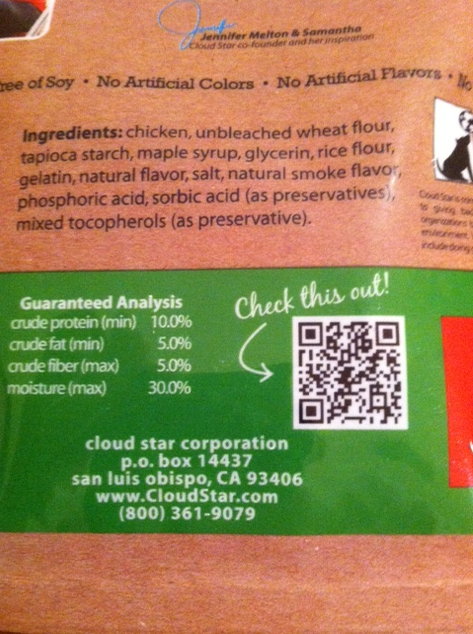 …Seriously, don’t bother using QR codes unless you use them right). Below are 20 great ways that you can use this fantastic tool. 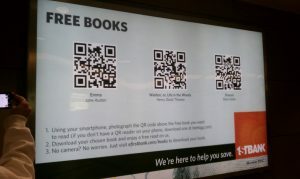 Place them on a physical advertisement to download free (or perhaps purchase) books. (Example above). Increase sales by letting customers access an online shopping cart for you advertised product or addition items related to said product. Send customers to product reviews. Save paper and money by placing instruction manuals online, accessible by scanning a QR code. Videos to demonstrate how to use a particular product. Provide free gifts to customers. Entice consumers to download your mobile application. Prompt consumers to download music. Place on a physical advertisement to allow the purchase of said product right on their phone. Provide additional information about specific works of art or historical artifacts at a museum. Place in books to send readers to relevant and interesting content. 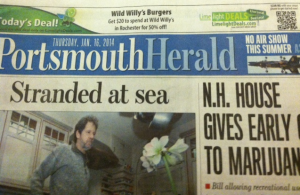 Put in newspapers to take readers to full interviews of which parts are quoted in articles. Place in magazines to provide additional information on an issue in video format. 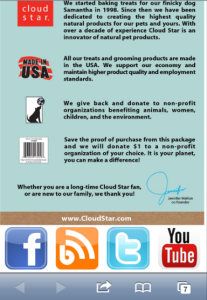 Use to collect consumer information for advertising purposes. Put on food packaging to tell the consumer where the ingredients originate from. Put on a table top display in your restaurant to prompt customers to “check-in” on social media. Place on menus to allow online ordering. Place on signs at entrances of malls to update customers about sales going on in the mall. Place on physical ads to connect target audience with interactive entertainment and provide brand interaction. 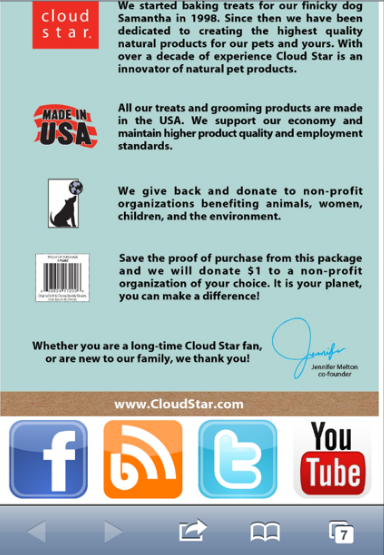 Offer discount coupon or entry into a drawing in exchange for an email address. These are only a handful of the many possibilities that QR codes open up to you and your business. Think outside the box, or just take an example from above. Any of these will help drive sales, increase efficiency, provide brand identification, or at least provide additional value to customers. QR codes make sense, just make sure you are using a platform that’ll let you use them right. I was at my local Barnes & Noble the other day browsing for a new book to go along with the other ten half read books on my night stand when I picked up a book titled The Light Between Oceans, by M. L. Stedman. I don’t typically read fiction, now was I particularly interested in this book, but for some reason I picked it up to read the back. Much to my delight I found a gift in the form of a QR code staring back at me. Evidence that publishers—in this particular case Scribner Publishing—are finally beginning to use this tool that has huge potential for the industry. 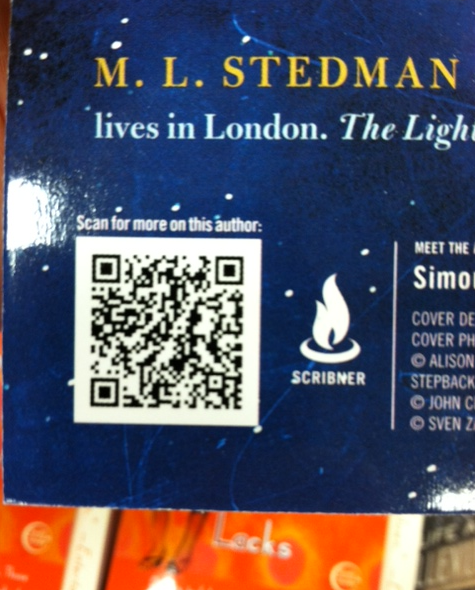 What Scribner Publishing used this particular QR code for was to introduce M.L.Stedman to potential readers. 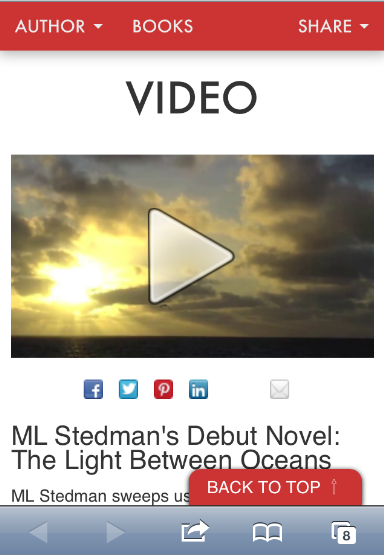 The reason for this was that this book, The Light Between Oceans, was Stedman’s debut novel. Thus he likely is not well known to many potential readers and the QR code intends to help change that. 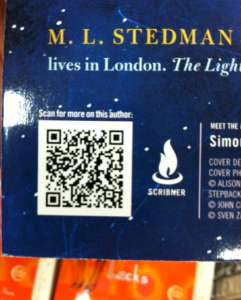 With the QR code a potential reader now has the ability to learn more about the author and more about his new novel. In fact, Scribner Publishing provides some engaging content in the form of a video introducing Stedman and his work, as well as a short write up. In addition to sharing the good word about Stedman, the Scribner mobile page also allows potential customers to learn about other authors and books that they publish, as well as share on social networks this particular book and author. Both great ways to advertise and increase sales. 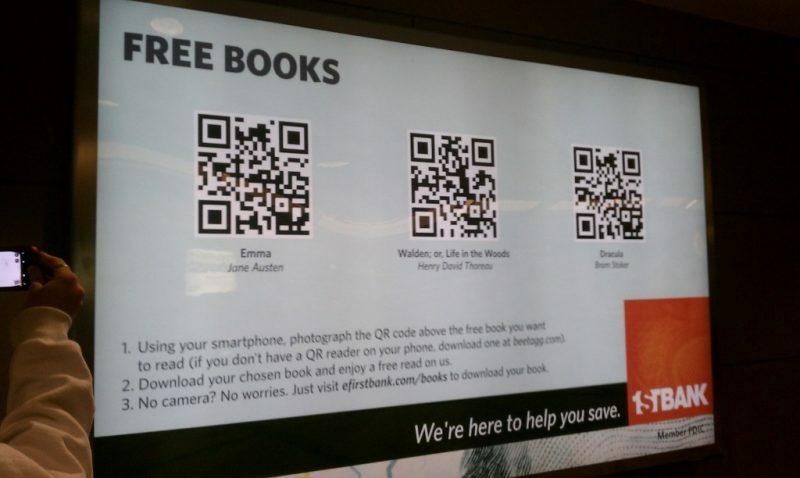 Though this is a nice little use of a QR code, there really is much more potential with QR codes in the publishing industry. For example let’s take a book like The Da Vinci Code, by Dan Brown. There is a ton of content referenced in that book including art work, statues, engravings, city maps etc. that cannot be visually shown in the book without adding many pages. However, if small QR codes were placed throughout readers could then be connected with this content in a visual way so as to understand more deeply what it is they are reading. The reading experience is now an interactive one, and far more interesting. In a more obvious way QR codes can be used in non-fiction books, perhaps an economics book might use QR codes to point out various sources, graphs, or other visual evidence that helps the point being discussed. Or perhaps a history book on ancient Greece uses a QR code to take the reader to photos of the fields of Marathon, or the Acropolis. Or perhaps a Biography on Martin Luther King might use a QR code to take the reader to a video of his famous “I Had a Dream” speech. This is a start for Scribner Publishing, but as you can see there is a huge realm of possibilities with this great tool. 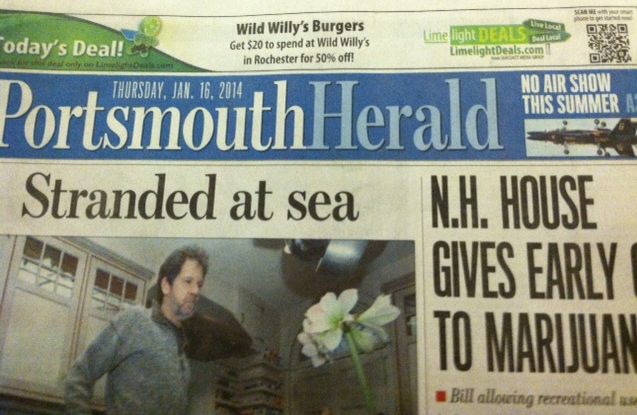 Publishers just need to start thinking outside of the box. QR codes allow publishers to connect the physical world with the online world and greatly enhance the reading experience of their consumers. I do not think it is a stretch to say that the tool of QR codes can greatly alter the future of publishing and our daily reading experience.